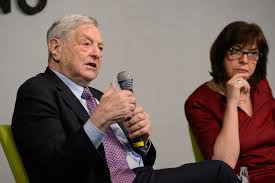 Rebecca Harms (MEP from Germany, European Green Party), one of the co-authors of the urgency resolution on Mehman Huseynov’s case, adopted by the European Parliament Jan. 17, is a person under the influence of George Soros and acknowledges it openly. It is no coincidence that she has numerous photos with Soros on social networks. The abovementioned resolution is an unsuccessful result of the insidious scenario planned against Azerbaijan by using the factor of Mehman Huseynov and intentionally stirring up the issue. On January 17, Rebecca Harms, an MEP and the co-chair of the Euronest Parliamentary Assembly, who was first to give speech at the discussions on the urgency resolution, stated that she was trying to establish contacts with her Azerbaijani counterparts regarding the issue. This is while neither the Azerbaijani Parliament, nor the Azerbaijani Foreign Ministry and Azerbaijan’s Embassy in Brussels received any appeal regarding the hearings held in the European Parliament. During the discussions, none of the MEPs, who were talking about human rights in Azerbaijan in their speech, remembered about 1 million Azerbaijani refugees and IDPs, whose fundamental rights were violated. This shows the hypocrisy of those MEPs. European Commissioner for Trade Anna Cecilia Malmstrom, who delivered speech at the discussions, said the EU closely follows the issue and the Azerbaijani government was cooperating on the issue. She noted that EU diplomats visited Mehman Huseynov, he stopped the hunger strike and there is no threat for his health. The protection of the rights of gays, lesbians and other sexual minorities or LGBT community in Azerbaijan holds one of the key places in the resolution. An important point is that Mehman Huseynov’s brother, Emin Huseynov, sent an email to the MEPs just before voting. In his email he expressed great regret regarding the statements by Anna Cecilia Malmstrom that Mehman Huseynov wasn’t on a hunger strike. Emin Huseynov said in the letter that he was "shocked". It is interesting if Emin Huseynov was shocked because he didn’t expect a high-level EU official to tell the truth or he was deeply disappointed that Mehman Huseynov didn’t obey the agreement reached?! The fact that Emin Huseynov hastily wrote an email to the MEPs before the vote, trying to make everyone believe in the show created by orders while meeting MEPs in Strasbourg, once again shows that this person isn’t interested in the fate of his brother, Mehman Huseynov, he has his personal interests and cares only about the benefits that he will get from this game by playing the music ordered by his patrons. Another noteworthy point is the fact that the first news about the resolution adopted by the European Parliament appeared in the Armenian press. Apparently, they were waiting for the adoption of the resolution. Undoubtedly, it is no secret who was pouring water over the mill of the European Parliament. The European Parliament resolution has no force and from time to time we witnessed some forces use such tools against Azerbaijan. However, it is also true that those who use such tools try to implement their insidious plans at the expense of the fate of persons like Mehman Huseynov.